Tirupathi is where Lord Balaji resides ,in one of his many forms,thats the speciality.Sri Balaji. 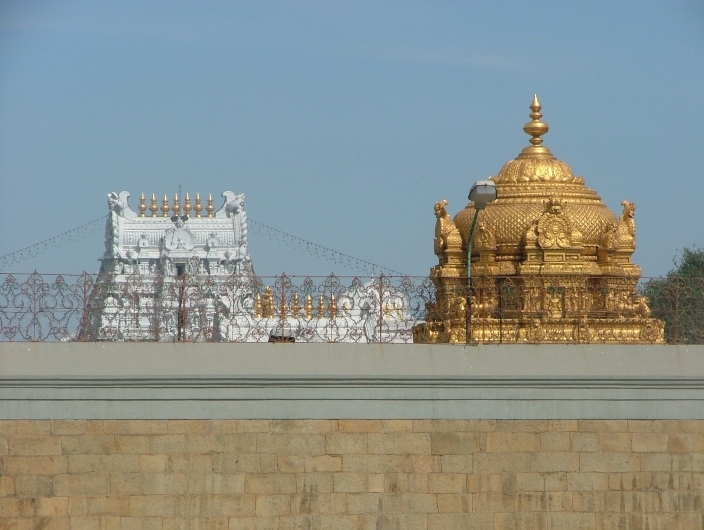 Tirupathi-The first thing that comes to any ones mind – Lord Venkateswara abode on Tirumala.Education – Srivenkateswara University(SVU), Srivenkateswara Veterinary University,Padmavathi Mahila University, SV Medical college etc. Has all professional colleges, undergraduate and graduate.Tourism – Best tourist places in Andhra Pradesh are all a few hours reachable distance from Tirupathi like, Kanipakam(Lord Vinayaka), Srikalahasthi(Lord Shiva), Talakona (Natural beauty with nice waterfalls), kalyanidam (water reservoir), chandragiri(Fort of Srikrishnadevaraya), Tiruchanoor, Srinivasamangapuram, Tondavada.Politics – Tirupathi is considered a fortunate place for almost many parties to start their campaignsPlaces within tirupathi to visit- Kapilatheertham, Ramulivari temple, Govindarajaswamy temple, SV Zoo park.Boarding and Lodging – Ranges based on the capabilty of the touristsMovie theatres – Best to worstHealth – SV Institute of Medical Sciences, Ruya, BIIRD (for artificial limbs) with best facilities and best doctorsVeterinary – Town hospital, College teaching hospital and ambulatory hospital at Tondavada.Accessabilty – Easily accessable to Chennai(TN) and Banglore(karnataka).Trains connecting to all major places in India with Renigunta railway junction.Airport at ReniguntaFamous RADAR station is located at Gadanki, an 1 hr drive distance from Tirupathi.Life – Diversified. Can entertain from kids to old.Walking in Gandhi Road and Bazar street during the evenings lets you see all the youth of tirupathi.Visit the Town Club or some resorts at the outskirts to see the mid-age crisis people.Need to go to Annamacharya Kalamandapam if you are old and spritual to meet people of your kind.Visit any university at any time of the year to enjoy the beautiful life of students, cultural programs, action fights, love stories and what not.Overall the speciality of Tirupathi in Andhra Pradesh is that it has LIFE in it. If you're talking about food, Tirupati Laddu – Laddu or Ladoo, a popular Indian sweet is made of flour and other ingredients formed into balls that are dipped in sugar syrup. The popularity of Laddu is due to its ease of preparation. In fact, Laddu is so popular that any chubby kid in India is affectionately called 'Laddu.' Variations in the preparation of Laddu result in different tastes. Laddu is often made to celebrate festivals or household events such as weddings. Thee most famous laddu is made at Tirumala in Andhra Pradesh and is immensely popular for its taste.